“Families here slaughter pigs before the Chinese New Year to celebrate harvest. It is also a time of reunion for relatives and friends, and they’ll sing and dance Achimugua then. The lyrics of the show should involve moments in the whole year,” said Li Biqing on Aug. 29. Tongle, a village with a millennium-long history, is the birth place of Achimugua. With blue sky, white cloud and green trees, it is also a livable place favored by people from outside. 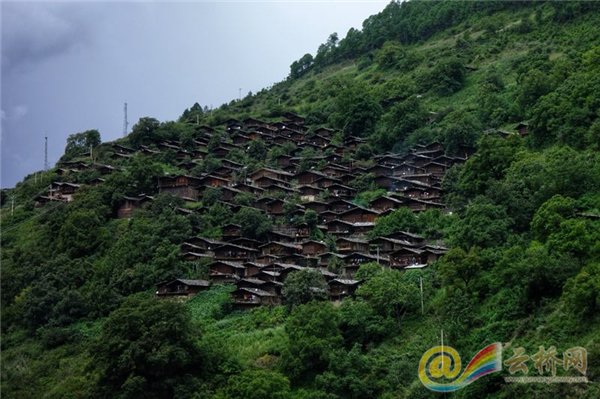 Local Lisu folks live in brown Muleng houses that scatter across the village. The woods and roof tiles, which are smoked day after day by fire pits, remind us the vicissitudes in history. Looked at from afar, the village is like a harmonious picture of spring verdancy and featured old dwellings. It took us 20 minutes to get to the village. We noticed that the street lamps were decorated by tobacco pipe-shaped patterns favored by Lisu people. The decorations also look like the hats of magicians in fairy tales. Noting we were here to visit, Li Biqing welcomed us at the entrance of the village together with her fellows. Joyful singing and dancing of Achimugua came to our ears, and the feeling of happiness immediately hit us. In the village, we saw harmonious scenes: chickens frolicking between Wuleng houses of Lisu people; a yellow dog lying in a basketball court and basking in sunshine; and a kitty guarding the house at the fire pit. 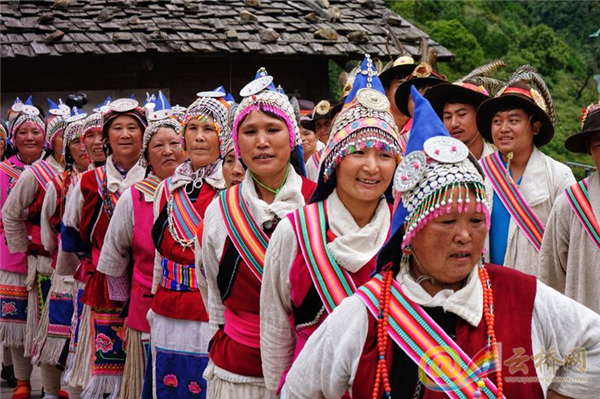 “Achimugua is a transliteration from the Lisu language, meaning the singing and dancing of goats or the tune of goat bleating,” Li Biqing said, in a passionate voice. Accompanied by Yu Xinzhi and Yu Xiuzhi, inheritors of cultural heritages of the Lisu spinning and straw weaving, Li told us something about Achimugua. 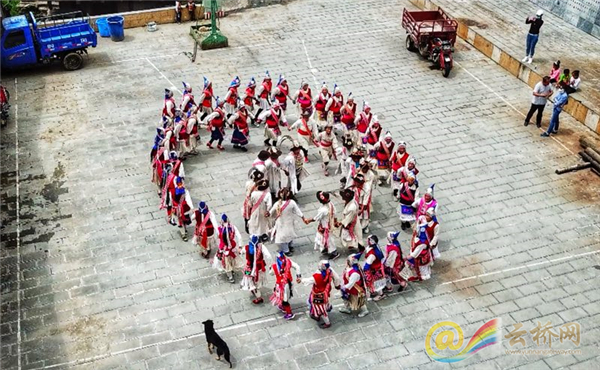 The art form was listed as a national cultural heritage in 2006, which cheered up the villagers a lot. 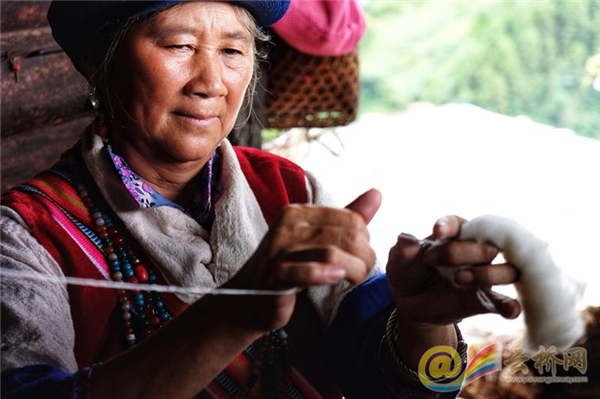 Li Biqing began to learn Achimugua at 14, when she was a shepherd. Then she found out it interesting to involve many aspects of life in the art form. During the ensuing decade, Li asked 4 seniors to be her teacher and by now she has mastered 80% of Lisu songs including Achimugua. Three of her teachers have passed away and to pass down Achimugua better, Li bagan to teach the art to others. Among her some 500 students, around 30 can lead the dance. 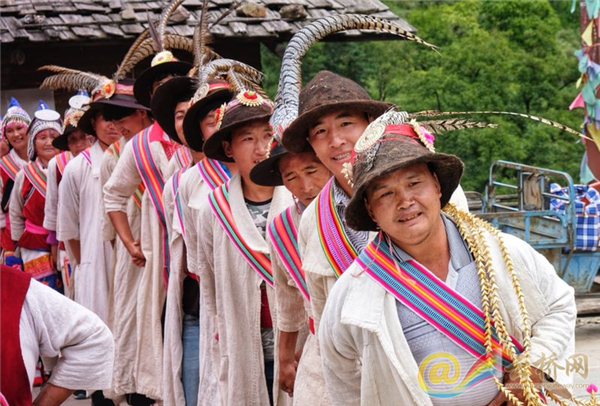 Praising works of Yu Xinzhi and Yu Xiuzhi are important for Achimugua costumes, Li Biqing told us people usually dress up when performing the show and they make the costume all by hand, from cotton growing to costume weaving. It is also customary to perform Achimugua on the day of cotton growing. Via lyrics, villagers express the joy in sowing, pray for harvest and show gratitude to Mother Nature. Li said that it generally takes half a year to complete a skirt. Every stitch should be careful and one can sense achievement the moment the shirk is done. Yu Xiuzhi was entitled inheritor of intangible cultural heritage at the age 18. “The elders should wear special hats in their costumes,” said Yu, with a pointy hat in hand. Li Biqing added that there are three kinds of leg wrappings in the costume: the cotton wrapping for daily use; the bamboo-made leg wrapping for farm works; and wrappings in hides for hunting. Li began to sing at the moment, showing almost everything can be included in a song and the singing is the only way to express words in heart. Now, there are 592 villagers belonging to 137 families live in the village and herb-planting is their main source of income. Thanks to the favorable natural environment, tens of thousands tourists come to visit every year and life is getting better and better. 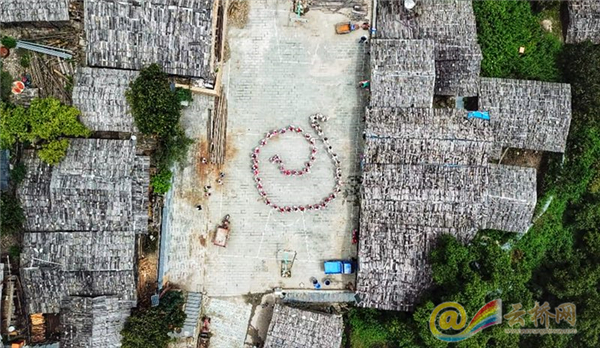 We walked through a path with fruits hanging on either side for villagers invited us to house of Yu Xinzhi to take a look at the spinning tools of Lisu people. We arrived at Yu Xinzhi’s soon. To our surprise, we found out the house she lives in was a 300-year dwelling. 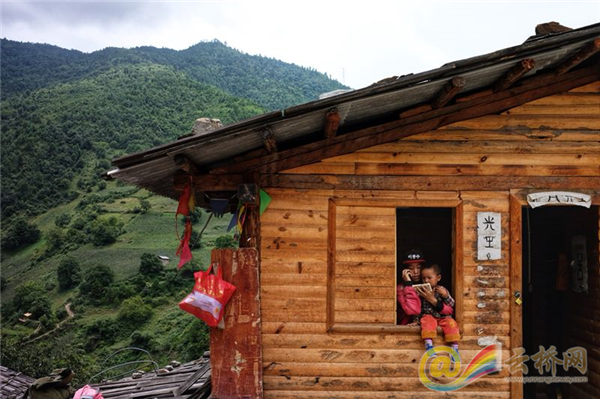 Yu, in a ruddy face, told us that each family here have three places to live: an old house, a makeshift house near medicinal herbs base, and one at the mountain foot near the Lancang River. The last place is used to spend winter. Yu then showed us several balls of string and some tools which appear like pieces of artwork preserved in museums. Old as they are, these tools can still be used by experienced workers, and they are helpful in weaving and spinning. They are living heritages and fossils of art works. “Help yourself!” said Li Biqing, serving a bowl of honey with bee wax. It was a sweet taste with the fragrance of various flowers. We suddenly realized something similar: Bees collect nectar to make honey, the gift from nature, and inheritors like Li Biqing, Yu Xinzhi and Yu Xiuzhi draw inspirations from the natural landscapes to enrich Achimugua, the gift of arts. The unique charm of Achimugua is the beauty of harmony between man and nature. Just like the name of the village—Tongle, it means “common joy” in Chinese language.